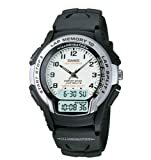 Because you're passionate about fitness, the Casio Men's Ana-Digi Illuminator Watch #WS300-7BV features a 10-record lap-memory option, with each record including the lap and split time details. A classic white dial face is embellished with alternating Arabic numerals and stand-out minute indexes, while a handy digital display allows a dual-time capability or day-date-and-month calendar. A black resin band comes equipped with a secure buckle closure. Other details include a stationary, resin-and-stainless steel black-tone bezel and 39.5-millimeter stainless steel case. Designed to accommodate your athletic lifestyle, this stunning timepiece offers style and innovation. It is powered by quartz movement and water resistant to 330 feet. I like it. It does what it says. You get two displays, easy to read watch. You can swim or even dive (not too deep though). This watch really got THE LOOK, good construction, and easy to operate (esp. adjusting the analog). 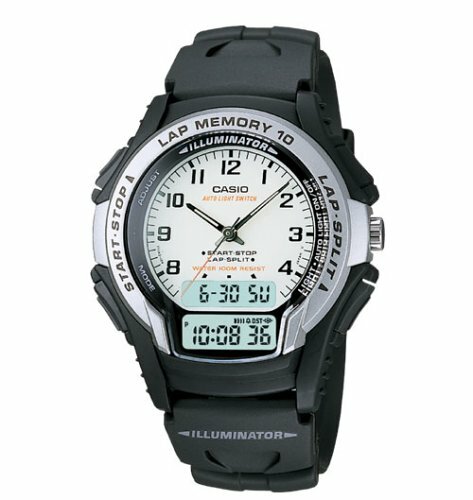 One of its best feature is the light; unlike other analog-digital watchs, this one has the light that illuminates both the analog and the digital display, which I miised in my old casio, where I was never able to see the digital display in the dark, like when want to see the date, etc..
an alarm and you can set it to beep on the hour. most of the other watches on the market which is nice if you have a smaller wrist or don't want to wear a clock on your wrist. I bought this watch to replace my eight year old $18 casio that died when I last went swimming.